This is a special Christmas Stocking perfect for a little girl or boy. Or make it for your sweetheart. Use different colors to make one for each member of your family. 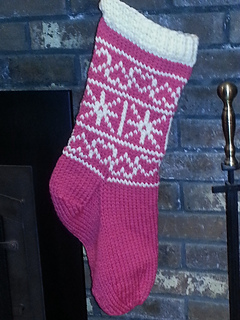 The generously sized stocking is quick to knit in a bulky weight yarn. Perfect for those last minute projects! The models are made with Brown Sheep Lamb’s Pride Bulky. It took one skein of the main color and a small amount of the contrast. Finished size - about 14” circumference x 23” long will hold lots of goodies!